The plant supports are perfect for showy heads, preventing stems from being snapped by the wind or flopping under their own weight, whilst keeping them from falling onto paths or straying into other plants. If left in place during winter months they are extremely useful for indicating where dormant plants will emerge the following season. 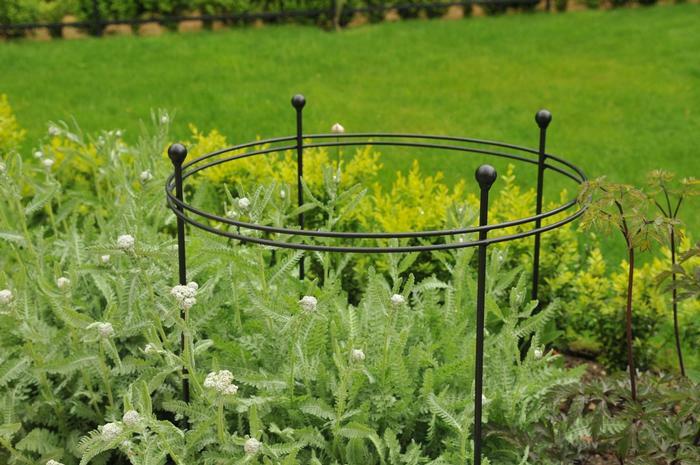 Exclusively designed and made by Harrod Horticultural, these quality plant supports use solid 8mm gauge round steel rods for the legs and 6mm for the rings. Available in 2 diameters (30cm and 45cm) and 2 heights (40cm or 60cm) the plant supports are designed to be pushed 10-20cm into the ground for stability and depending on the required height for the plant. These stunning supports are available in a classic matt black powder coated finish or untreated steel which quickly develops an even rust coating for a long lasting weatherproof finish and comes with a 5 YEAR STUCTURAL GUARANTEE.